We have successfully arrived in Armidale and checked into a motel. We had intended to camp for the night but it is raining rather nastily here, so we've gone for the dry option. Left Canberra without any problems and enjoyed a lovely lunch with some of my family. The rain meant their normally lovely view of Lake Macquarie was a little clouded. We traveled along Bucketts Way and Thunderbolt Way to reach Armidale. It was a really nice road, lots of beautiful scenery (hills, trees, creeks) and I will definitely travel it again. It was a little windy and very steep in some places (not so much fun in the rain) but less crowded than the New England would have been. 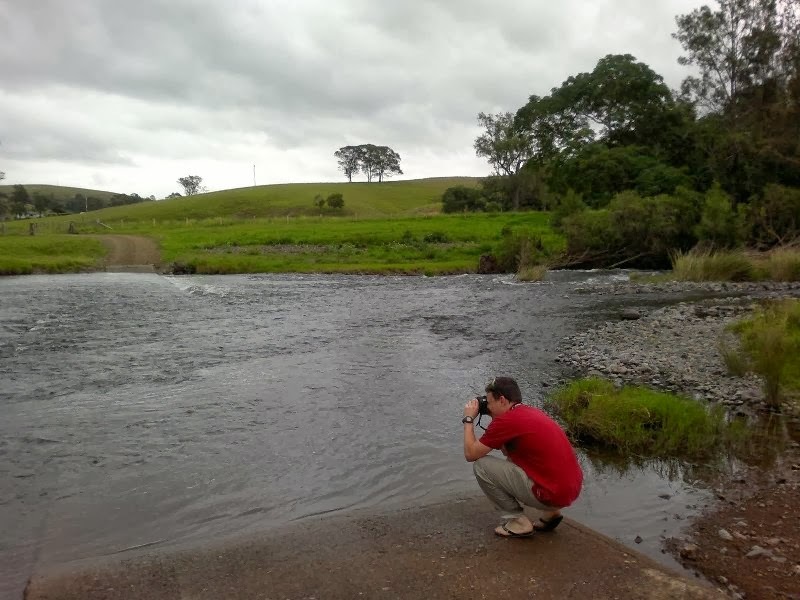 The photo above is of SJ (taking a photo) at a camping area on the Manning River. It was a really nice spot and we've remembered it for future trips. We would have spent the night but had nothing organised for dinner. Only around 5 hours to Toowoomba now, so we should be at SJ's brother's around lunchtime. I'll be rather tired by then (drove solo today) but his 2 year old nephew is sure to revive me.